From the days when New Zealand was first settled, it has lost proportionately more living species than any other nation in the world. Our pioneers had no idea of the damage they were causing as they cleared the land - today however there are no excuses. Much of New Zealand's unique beautiful wildlife has gone. Numbers decrease as hunting, disease and habitat destruction continue. Legislation for the protection of New Zealand fauna is good by world standards, although it does not extend to a threatened species' habitat. 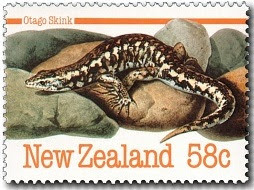 Several of New Zealand's fascinating reptiles and a rare amphibian are featured on this special stamp issue. 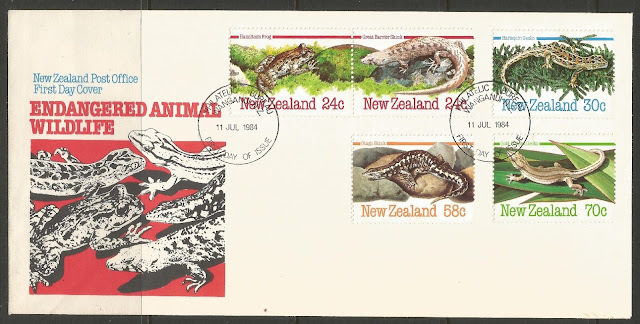 The five stamps depict the rare Hamilton's Frog; Great Barrier Skink; Harlequin Gecko; Otago Skink; and the Gold-striped Gecko. 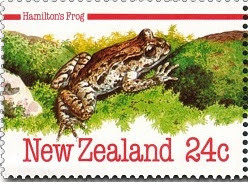 Hamilton's Frog - one of three species of native New Zealand frogs and regarded as being among the rarest amphibians in the world. It is considered an unusual frog because it lives under stones and well away from standing water, depending on high humidity for its entire life cycle. 24c - Great Barrier Skink. 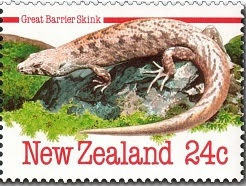 The chevron skink (Māori: niho taniwha), is a large species of skink found only on Great and Little Barrier islands in the Hauraki Gulf. A cryptic forest dweller, it can hide underwater, and is under threat from introduced rats. 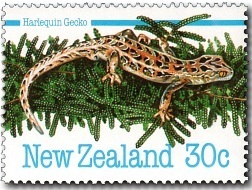 This gecko only became known to science in 1981 and is found only in the southern part of Stewart Island. It is one of the most spectacularly patterned of New Zealand geckos and also the rarest. Another rare lizard which, unusually, chooses a sub-alpine habitat, the tussock country of Otago in the South Island. In daytime these large skinks, some over 300mm long, come out to bask on sunny outcrops. 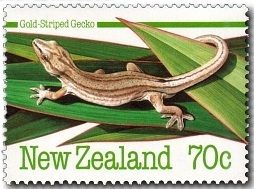 70c - Gold-striped / Taranaki Gecko. Also known as the Taranaki Gecko, is found only in the Taranaki Province and Mana Island, both in the west of the North Island. Growing up to 140mm in length these small geckos are mainly nocturnal and so few have been seen, that their natural habitat remains uncertain. First Day Cover - 11 July, 1984.